How to Recover From Slip and Fall Facial Dental Injuries | Hupy and Abraham, S.C. Treatment for these injuries will depend on the extent of your injury, your age, and your overall health. 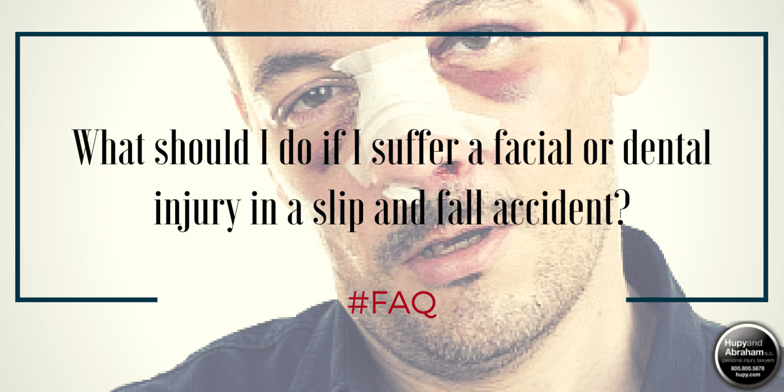 Facial and dental injuries can be serious consequences of slip and fall accidents. Your injury may be painful, your treatment may be extensive, and your financial losses may be substantial. It is important to see a doctor, dentist, or endodontist as soon as possible so that you can manage your pain, prevent your injury from worsening, and get the treatment that you need to get better. Help you determine if you have a case by reviewing the facts about your fall. Gather and preserve the evidence surrounding your accident. Value your damages and advocate for your full and fair recovery in an insurance settlement or in a court of law. Your attorney can help you get the fair recovery that you deserve if you’ve suffered any of these damages due to the negligence of a property owner or manager. For more information about your rights, please start a live chat with us now to schedule your own free, no-obligation consultation.